Steele’s Island is a unique holiday destination, in that its idyllic location is secluded, yet central to the state's capital city and airport, and popular tourist attractions. 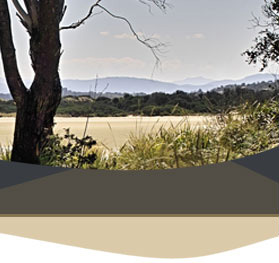 It consists of seventeen acres of natural flora and fauna and provides guests with tranquility and privacy, and the opportunity to relax and rejuvenate whilst on holiday or attending a conference.On a walk around and over the island, you can find more than sixty different species of native plants and forty different species of birdlife in their natural habitat, not to forget the wallabies, possums, echidnas, blue tongue lizards, rabbits and wombats that inhabit the island. For forty thousand years, Steele’s Island was home to generations of indigenous families, whose diet consisted mainly of the oysters that grow just off the island’s shores. As a result, the island has a beautiful, significant and protected site that relates to the original inhabitants. During the convict era, in the early eighteen hundreds, the island was part of a land package purchased by Joseph Steele, one of the first settlers in the Carlton area (land grants in the area began in 1812) who had also received land grants in the area. Life for the first families in the area was hard and somewhat hazardous, typical of life for early settlers. Joseph built historic Carlton House on the banks of the Carlton River and was a good 'mate' of O'Hara Booth, one of the commandants at the Port Arthur penal settlement at the time. He is buried with his wife and several of his children in a graveyard not far from the island, near the site of the first church, schoolhouse and post office built in the area. The remains of the church and the original post office, one of the oldest and longest serving post office buildings in Australia (1842-1949), still stand on the banks of the Carlton River. These buildings can be seen from the river whist kayaking, or from the road when traveling through Carlton on the alternative route to Dunalley on the way to Port Arthur. To reduce the threat of snake bite and bushranger attacks experienced on the inland route, according to folklore, the convicts were often walked from Port Arthur along the coastline to what is now known as Primrose Sands. They then waded across the Carlton River at low tide and walked around the shores of Steele’s Island to Dodges Ferry. From there they were taken by sea vessel to Seven Mile Beach to continue their journey on foot to Hobart Town. Steele’s Island provides the perfect backdrop for educational groups. Photographers, artists, club members and birdwatchers as well as, hobby, sport and nature groups appreciate the natural experience, together with the learning and activity options available due to the unique location and natural resources of the island.